The sun, like a quivering organ, brings the flimsy desert air to convulsion. To breathe in the dry heat of the desert is to drink up California’s oft referenced part. In Indian Wells, CA, the desiccant climate is whetted every year by the cool, shiny talent of the world’s best tennis players. John Fante captures both the desolation and the bursts of life of such a climate in his seminal L.A. novel Ask The Dust: “The desert was always there, a patient white animal, waiting for men to die, for civilizations to flicker and pass into the darkness. Then men seemed brave to me, and I was proud to be numbered among them. All the evil of the world seemed not evil at all, but inevitable and good and part of that endless struggle to keep the desert down.” This endless struggle to “keep the desert down,” is epitomized by the tournament at Indian Wells, where the struggle suspends into a wondrous fortnight of competition. 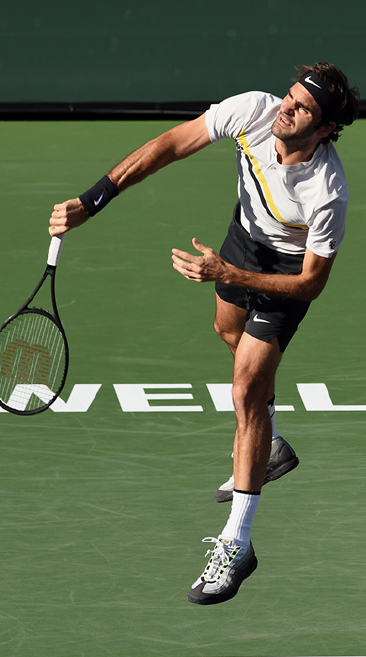 A contestation of spirits hovered above center court at the BNP Paribas Open on Sunday, as Roger Federer and Juan Martin Del Potro competed for the Masters 1000 title. The match, while expected to be a violent clash of power and grace, heightened into an existential arm-wrestle. It became an unstable substance, that precious and precarious spectacle that fans both dream and have nightmares about. The outcome was all but impossible to predict, the level of tennis so stratospheric, that one almost saw victory as Pyrrhic, as a sad comedown from genuine greatness. En route to the final, both Federer and Del Potro had to recover from a few stumbles. Del Potro catalogued two three-set wins, Federer just one, and each craved the California crown. Federer entered the tournament as the number one ranked men’s player in the world, a feat, at age thirty-six, deserving nothing short of deification. Federer was also 17-0 in 2018, another notch in a belt that has run out of notches. Del Potro, on the other hand, continues on his trajectory entitled “The Long Way Back.” Ever since his 2009 U.S. Open victory (over Federer), Del Potro has been continually decimated by injuries, and has been ascending with the deliberate pace of tortoise. But do not let Del Potro’s crawl a detract from his consummate skill; he is now “back,” and a force to be reckoned with. The final match positioned itself from the start to be anthologized. It was quintessential play, but quintessential for Federer and Del Portro means the rest of us should seek cover. Del Potro captured the first set, 6-4, and seemed to be a click ahead of Federer, serving with crushing pace and hitting forehands that seemed to de-felt their objects of affection. In the second set, Federer looked sharper, and the whip of his swing comported itself with aplomb. He took the second set 7-6, winning the tiebreak 10-8 in nail-gnawing fashion. To the third we went, with love and with fear, not wishing the match to end, but loving the grace shown by extension. It seemed like a timeless rivalry (much akin to the old Federer-Nadal battles), that in reality hasn’t existed, but now in our dreams is firmly planted. Federer stepped ahead at 4-4, breaking Del Potro to go up 5-4 and serve for the championship. In a game whose brilliance could serve as a precis for the entire match, Del Potro fought off two championship points and somehow broke Federer in a flash of forehands and determination. The two wrestled all the way to a tiebreaker at 6-6, which Del Potro dominated in aberrant fashion, 7-2, winning the set, the match and the tournament. The outing on Sunday at Indian Wells proved these two men in opposition create a synergistic spectacle it would be a sin to miss. To quote The New Yorker headline: “Is It Too Late For a Rivalry Between Roger Federer and Juan Martin Del Potro?” God I hope not.